The political scene is not a pretty one: A new president facing his first midterm election with declining approval ratings as his party struggles to keep the upper hand in Congress – all in the midst of a darkened political environment where the unemployment rate hovers around 10%. It is a description, however, of both past and present. In short, we have been here before. Prior to Barack Obama and the Democrats, Ronald Reagan and the Republicans faced a similar challenge in the midterm election of 1982, weathering the situation about as well as they could. The GOP dropped 26 seats in the House (a result the Democrats’ would probably accept now, no questions asked) while adding one seat to their Senate majority. It was in the states that Republicans took their biggest hit in 1982, losing eight governorships from their total in 1980. But a Democratic landslide was averted that could have put a stop to the “Reagan Revolution” before it was barely underway. How did it happen? Second, the Republicans in 1982 benefited from the luck of the draw. Most Senate elections were being waged on the Democrats’ half of the field, as the party was defending 19 of the 33 seats that were up that year. On the House side, 1982 was a redistricting year, with 17 seats mainly moving from the Democratic-leaning Frost Belt to the Republican-leaning Sun Belt. The GOP ultimately did not realize the gains from redistricting that they had hoped for in 1982, but reapportionment probably helped keep the party from suffering much bigger House losses. The concept of perseverance was summed up neatly in the GOP’s three-word slogan: “Stay the Course.” As a line of argument, it was not compelling enough to hold many of the economically pinched, blue-collar “Reagan Democrats,” who had been an instrumental part of the GOP’s broad and victorious coalition in 1980. But it did help activate much of the party base. While the Democratic House vote increased by more than 6 million votes from 1978, the Republican congressional tally in 1982 also rose by more than 3 million – helping the GOP to hold down the size of their losses. Given the economic angst abroad in the land, the Republicans survived the 1982 election about as well as they probably could have. The GOP added one seat to its Senate majority, while losing 26 seats on the House side, where the party was already in the minority. Republicans took the biggest hit, though, at the gubernatorial level, where they lost eight seats from their total immediately after the 1980 election. Note: An asterisk (*) indicates that the current Democratic House total does not include the New York seat vacated this year by Democrat Eric Massa, nor does the Democratic Senate total include independents Joe Lieberman of Connecticut and Bernard Sanders of Vermont. Sources: Vital Statistics on Congress (The Brookings Institution) for congressional totals in 1980 and 1982; Elections A to Z (CQ Press) for gubernatorial totals in 1980 and 1982. 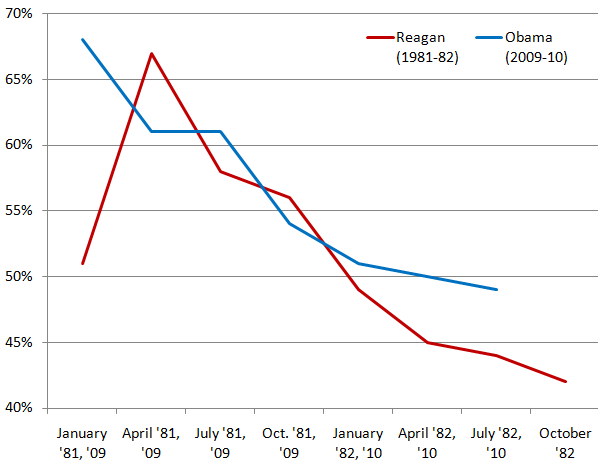 In some respects, the Democrats are in better position to weather 2010 than the Republicans were in 1982. Then, the unemployment rate was rising steadily throughout the year – from less than 9% at the beginning of 1982 to nearly 11% on Election Day. The high unemployment tended to trump signs of life in other parts of the economy, such as declining inflation and a decrease in interest rates. On the other hand, the unemployment rate thus far this year has been slowly going down, from more than 10% in late 2009 to 9.5% now. Some other parts of the economy have failed to gain much altitude, but the closely watched unemployment rate at least is not a “killer” for the Democrats. Like the Republicans in 1982, Democrats this year should have a field of reasonably strong candidates, especially in the districts that they picked up in 2006 and 2008 that helped transform the party from a minority to a majority in the House. Many of these candidates, now incumbents, were specifically recruited by Democratic campaign officials because of their ability to be elected in moderate or conservative districts. The Democrats are also doing much better this year on generic congressional ballot tests than the Republicans were in 1982, when the GOP ended up losing the aggregate nationwide House vote by 12 percentage points. This year, the lead on the generic ballot question has been flipping back and forth between the two parties, with the Democrats up by 4 points in the Gallup Poll’s July 19-25 weekly tracking. This advantage, though, could be readily offset by the “enthusiasm gap,” which has strongly favored the Republicans throughout much of 2010. In some ways, the gap is difficult to comprehend, given the success of the Obama administration on major issues from health care to financial reform. For better or worse, Obama has multi-tasked rather than focused on the economy as Reagan did in the opening stage of his presidency. And it is clear that the Democrats’ route to economic recovery – featuring a costly stimulus plan, huge deficits and a hint of future tax increases – is less appealing to voters than were Reagan’s tax and spending cuts. Maybe a slogan in the vein of “Stay the Course” would not work for the Democrats this year, given its recent identification with President George W. Bush and the defense of his Iraq war policy. But in 1982, it did underscore the need for Republican voters to stay loyal to their president and their party in order to avoid a debilitating landslide loss that might compromise the future of both. For the Democrats this year, the challenge is similar. Buffeted by bad economic news, Ronald Reagan and Barack Obama have seen their presidential job approval ratings take a similar path over their first 18 months in office – steadily downward. Obama’s has been in a downhill slide since his inauguration in January 2009. Reagan’s initial job approval rating was a modest 51%, a figure that matched his winning percentage in the 1980 presidential election. But Reagan’s approval rating zoomed upward after an unsuccessful assassination attempt in late March 1981, before beginning a long descent that did not hit bottom until early 1983. Note: President Reagan’s approval ratings for 1981-82 are based on the Gallup Polls taken closest to the first day of each quarter, with the exception of the January 1981 poll which was the first taken after his inauguration. President Obama’s approval ratings for 2009-10 are based on three-day rolling polls by Gallup that were taken with the first day of the new quarter as the end date (or the second day in the case of the January 2010 entry). As with Reagan, the timing of the January 2009 poll is an exception and was the first one taken after Obama’s inauguration. The midterm elections of 1982 and 2010 are already linked as the only two in the last half century where the nation’s unemployment rate hovered around 10%. However, the trend lines in each year were different. 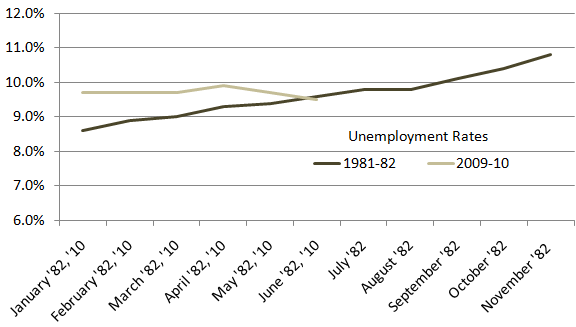 Throughout 1982, the unemployment rate was on the rise, breaking the 10% mark in September and continuing upward until it approached 11% in November. In this election cycle, the unemployment rate has been going down grudgingly, from a high of 10.1% last October to the latest rate of 9.5% for June. 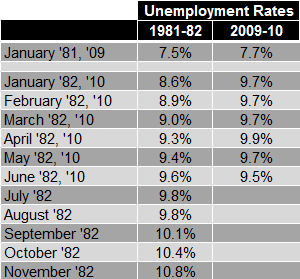 Note: The nationwide unemployment rates listed here are seasonally adjusted.